This entry was posted in News on April 17, 2013 by Athol Moult. In the first three months of 2013, South Africa lost 203 rhinos to poaching – more than two rhinos per day. Conservationists and their agencies are now being challenged to find new ways of dealing with the scourge. WWF South Africa (WWF-SA) recently announced a number of strategic initiatives to combat rhino poaching, including a focus on addressing the increased demand for horn in South-East Asia and in particular, Viet Nam. 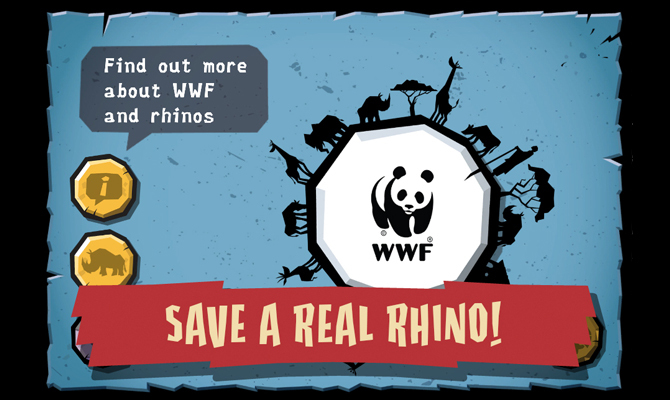 Deploying the global phenomena of mobile gaming, the organisation aims to shift perceptions about the use of rhino horn via an interactive and engaging mobile game, “WWF Rhino Raid”. WWF-SA, in partnership with Flint Sky Interactive, is poised to launch “WWF Rhino Raid” developed entirely in Cape Town. “We are proud to be developing a unique homegrown solution to address a very serious South African problem,” says Flint Sky director, Athol Moult.